Did The Walking Dead's Michael Cudlitz Spoil A Character Death? It should go without saying that there are possible spoilers ahead for Season 6 of The Walking Dead. Then again, maybe they aren’t. When a show has proven time and again that it has no problem killing off characters, rumors about potential character deaths are a way of fictional life. And it looks like actor Michael Cudlitz, who plays Abraham on the in-production The Walking Dead, may have spoiled the death of a character that sadly isn’t Father Gabriel. We’re talking about Eugene “I’m only lying when my mullet is showing” Porter. Now, it’s clear that this could all be for naught, but Cudlitz’s reaction has us more suspicious than normal. Undead Walking posted a screenshot of the now-deleted tweet, which shows how Cudlitz reportedly responded to a tweet of Josh McDermitt, who plays Eugene, when McDermitt noted that he was off filming a movie. And when fans started reacting to his comments as if they were indeed a sign of things to come on The Walking Dead in Season 6, Cudlitz hit the brakes instead of taking the time to explain himself. Here’s how he revised his post. Now, maybe he just didn’t feel like explaining himself to a bunch of random Twitter users, and decided to avoid the topic completely by reneging on his words. But if that’s the case, then why isn’t McDermitt in Georgia taking part in the filming of Season 6? There are a bunch of reasons that could happen, from Eugene’s limited amount of scenes being completed to…something else. But it certainly seems suspicious. Now be warned, because comic spoilers are ahead. So, in Robert Kirkman’s comic series, Eugene is actually still alive in current issues, while Abraham was killed a while back by one of Negan’s Saviors. We’re not expecting to see Negan for a while, so it’s not like the characters will be switched around; Eugene would just bite the bullet in an original fashion. It’s nothing new for Kirkman and showrunner Scott Gimple to shake up stories for audiences, and TV Eugene never really felt like a character who would live forever. 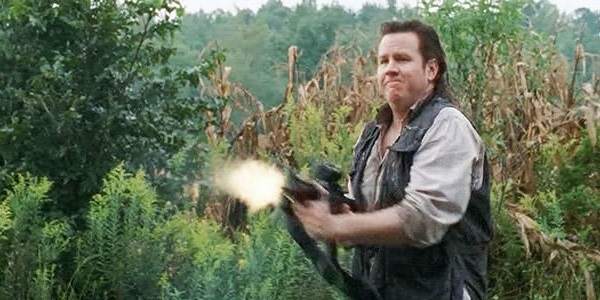 So this wouldn’t surprise me if Cudlitz’s tweets ended up being indicative of Eugene’s demise. Find out who will live and who will die when The Walking Dead returns to AMC this fall.